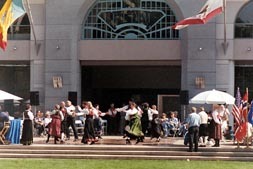 The Fall Scandinavian Festival "Fab Five In the Fabric of Our Lives" takes place Sat., Oct. 9, 2004, from 10 a.m. until 5:30 p.m., on the campus of FIDM (Fashion Institute of Design and Merchandising), 919 S. Grand Los Angeles. The "Fab Five" are, of course, Denmark, Finland, Iceland, Norway and Sweden. And our urban festival celebrates Nordic threads in the diverse and colorful fabric of life in Southern California. After we lost our 11-year-old home base in Santa Monica in the aftermath of 9/11, the festival was reborn in a beautiful new venue in the heart of the city. FIDM is between Hope and Grand/Olympic and 9th -- not far from the Staples Center. It's hard to convince some of you that downtown Los Angeles has been reborn. But you owe it to yourself, and the Viking spirit of exploration, to check it out. Have you been to the new Walt Disney Concert Hall? It's blocks away from the festival site. Like true Nordic spirit, this festival is more about introductions than insulation -- and the continual rebirth of community through rituals and explorations, costumes and collaborations, art and adventure in an exciting city with so many influences from around the globe. The day-long festivities include Nordic costumes, cuisine, arts, crafts, vendors, folk dancing, Scandinavian music -- from rune singing to rock -- guest performers, a children's corner and festival raffle. There is parking across from entrances -- and handicap access. The architecturally stunning FIDM main campus connects to the quiet 15-acre Grand Hope Park, with its mosaic water fountains, ivy-covered arbor walks, and metal sculptures in the heart of "renaissance" LA" -- one of the world's most influential cities with an energetic mix of cultures that helps shape the world's sense of casual and cutting-edge style. Admission to the festival is a donation of $6. Children under 12 are free. The festival raffle offers a great opportunity not only to support the work of American-Scandinavian Foundation of Los Angeles, but to win valuable prizes including tickets to cultural events, weekend getaways, import items, tickets to Scandinavian Film Festival LA, and the raffle grand prize -- travel to Scandinavia. The more you invest in your raffle donation, the more tickets and chances you have of winning. But you're already a winner just by supporting the festival and sharing in the work of ASFLA. The festival serves as a fundraising vehicle for ASFLA and the ASFLA scholarship program, offering seven scholarships to outstanding upper-division and graduate students at Los Angeles-area colleges and universities. The event also helps the fundraising efforts of various Scandinavian organizations from around Southern California. We need your help in making this year's festival a success. During the festival there literally will be Nordic fabric and design in the FIDM Museum -- as it hosts a Marimekko exhibit from Finland. Have a day "on the town" Oct. 9 at the ASFLA Fall Scandinavian Festival -- "Fab Five In the Fabric of Our Lives." A Southland favorite, the ASFLA Scandinavian Festival is part of the LA County Board of Supervisor's October Cultural Diversity Month. Click here for a copy of the poster (pdf). Click on the PayPal button below and automatically pay your admission donation now! Poster graphic designed by Olaf Olden.